Our Legal Association provides a comprehensive economic law service for businesses on Budapest-Győr-Wien axis and its surrounding regions. Proficiency expressed in numbers: more than 15 years of work-experience, 11 years of legal education and research and 8 cooperative partners. In case you want a professional legal team to manage your business’ legal issues or we can be of any other further assistance, please let us know. After mapping the company’s processes, the next step is legal due diligence. In a result we make suggestions from the point of view of legality and efficacy. We provide your company a permanent legal representation and compliance with a fix weekly consultation appointment. We provide your company a professional representation as if civil proceedings or settlement out of court. In parallel to lasting entrustment we involve experts for special cases as if any areas of law. This website is sustained by Dr. Dobos István, registered lawyer in Budapest Bar Association (registered office: 1026 Budapest, Szilágyi Erzsébet fasor 43/A.) and Dr. Kőhidi Ákos registered lawyer in Győr-Moson-Sopron County Bar Association (registered office: 9022 Győr, Bajcsy-Zsilinszky út 54. 2/22) according to acts of legal practice and internal policies which can be found on www.magyarugyvedikamara.hu webpage along with information about the client’s rights. 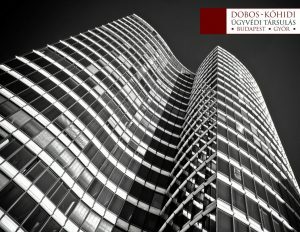 Web-blogs and articles available on the website do not qualify as certain legal advice, proposal or call for proposal, they are for information only about the areas of expertise and services of Dobos and Kőhidi Legal Association.